sorry for the delay, it was a looooong week. 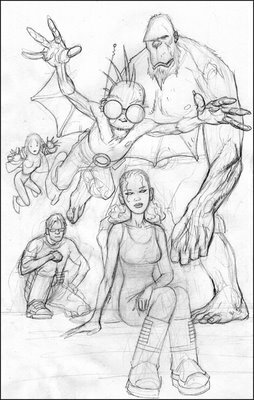 needless to say, craig and i are hard at work on the next perhapanauts series (rico not so much, but we'll have stuff to him soon enough!) and we're almost 100% positively certain that it's gonna be tremendously better than the first one--and we were pretty happy with that! 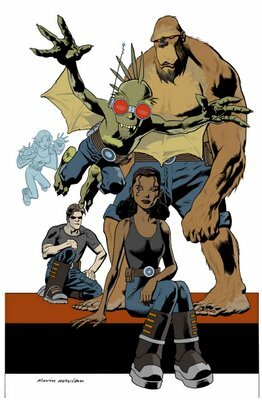 craig is batting out some amazing covers--they just keep getting better and better!--and i'm thrilled with the way these characters keep changing my story on me! they just keep asking for more! 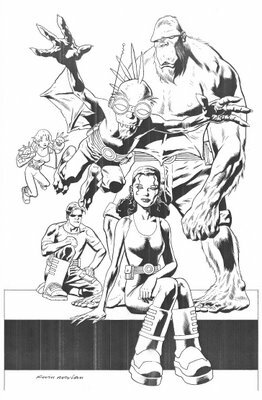 okay, so, for those of you who didn't go over to craig's site last week and see the awesome job he did coloring kevin nowlan's pin-up, or to see the pin-up itself--well, you're a jerk. get over there! craig's site is waaaay cool! but i felt a little gyped that i didn't get a chance to gush about what an amazing job kevin did and what a really nice guy he is. i met kevin and his wife deann at a heroescon in charlotte about 4 or 5 years ago and was thrilled when i got to sit with them at dinner the first night there. we chatted and told stories and i did everything i could not to shift into drooling fanboy mode and i guess i did a pretty good job, 'cause when i 'e'd kevin to ask him if he'd do a pin-up for us, he didn't hang up. (yes, i know you can't hang up on an e-mail--i was just making a point.) anyway, he was kind enough to look at the books and then said that his schedule was loaded but that he would try to fit it in 'cause the book seemed fun. well, he DID fit it in and all i can say is that craig and i were in jaw-dropping awe as first the sketch pencils came through and finally the inks and kevin made our own characters look new to us. i'd go on, but i'm realizing that the best way to show you is to show you...so here. thank you, kevin! your perhapanauts have made these two fanboys very, very happy! Wow! Now that is some really nice work, by both Kevin and Craig! I finally started reading the books you sent me, and I liked #1 a lot. Was the resemblance of Guy to your old pal, Barney Martin intentional...? Anyway, looking forward to reading the rest, and thanks again for sending 'em along! Also, thanks for the nice comments on my blog. It IS nice to know I'm not alone. ;-) And speaking of, did you notice I had your blog linked there? I love the idea that we can all link to each other, and hopefully, all benefit from each other's regualar readers. yeah, i'd link you too---if i could figure out how to do it...i'm such a retard about these things. i guess i'll hafta go back and look and actually read the directions this time. thanks for the comments, though, man. Great to hear that the second Perhapanauts series is hummin' along! Oh, yeah..... and the Nowlan piece is wicked!